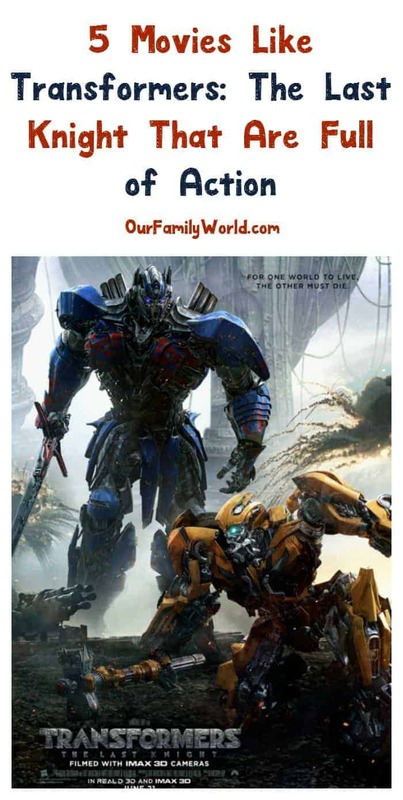 Looking for more great family movies like Like Transformers: The Last Knight? Check out these 5 action-packed picks! As you know, The Last Knight is an upcoming science fiction action movie that will be in theaters on June 23, 2017. It’s the latest film in the Transformers franchise and the last one that will be directed by Michael Bay. Check out more fun trivia about the movie, then read on for other great movies for you to check out. What are your favorite action movies like Transformers: The Last Knight? Are you planning to see this one in theaters? Tell us below! Planning to see Transformers: The Last Knight in theaters? Don’t risk getting sold out! Sign up for a Fandango Fanalert to find out when tickets go on sale for your area! G.I. Joe: The Rise of Cobra is a 2009 military, sci-fi, action movie that is based on the G.I. Joe line of toys by Hasbro. It is also the prequel to the 2013 G.I. Joe: Retaliation. An elite military unit, known as G.I. Joe- Global Integrated Joint Operating Entity- battle an evil arms dealer, James McCullen and his organization, Cobra. G.I. Joe: Rise of Cobra stars Christopher Eccleston as James, Channing Tatum as Duke, Marlon Wayans as Ripcord and Dennis Quaid as General Hawk. Iron Man 2 is a 2010 superhero movie that is based on Iron Man, a character from Marvel Comics. It is the sequel to the 2008 movie Iron Man and the prequel to the 2013 movie Iron Man 3. Tony Stark is dealing with his failing health as well as dealing with a pair of mad men, Ivan Vanko and Justin Hammer, who are out for vengeance against the Stark family. Iron Man 2 stars Robert Downey Jr. as Tony Stark/Iron Man, Mickey Rourke as Ivan and Sam Rockwell as Justin. Real Steel is a 2011 science fiction, sports movie that is based on the 1956 short story, Steel, by Richard Matheson. Set in the year 2020, a discarded robot becomes a robot boxing champion, thanks to a struggling promoter, Charlie Kenton. Real Steel stars Hugh Jackman as Charlie. Battleship is a 2012 movie that features sci-fi, action and military. An international Navy fleet of ships, which includes the guided missile destroyers USS John Paul Jones and USS Sampson, battle against a group of invading aliens. Battleship stars Taylor Kitsch as Lieutenant Alex Hopper, Rihanna as Gunner’s Mate Second Class Cora Raikes, Brooklyn Decker as Samantha Shane, Alexander Skarsgard as Commander Stone Hopper and Liam Neeson as Admiral Terrance Shane. Pacific Rim is a 2013 science fiction monster movie that is the prequel to Pacific Rim: Uprising, due in theaters on February 23, 2018. Former pilot, Raleigh Beckett and pilot trainee Mako Mori, team up to save mankind from monstrous sea creatures. Pacific Rim stars Charlie Hunnam as Raleigh and Rinko Kikuchi as Mako. Any of these awesome action-packed movies like Transformers: The Last Knight would be the perfect addition to your family movie night! Watch one on a rainy day or watch them all for a fun movie marathon weekend!